Plasmodium vivax and Plasmodium ovale are often considered the malaria parasites best adapted to long-term survival in the human host because of their latent exo-erythrocytic forms. The prevailing opinion until the middle of the last century was that the maximum duration of Plasmodium falciparum infections was less than two years. 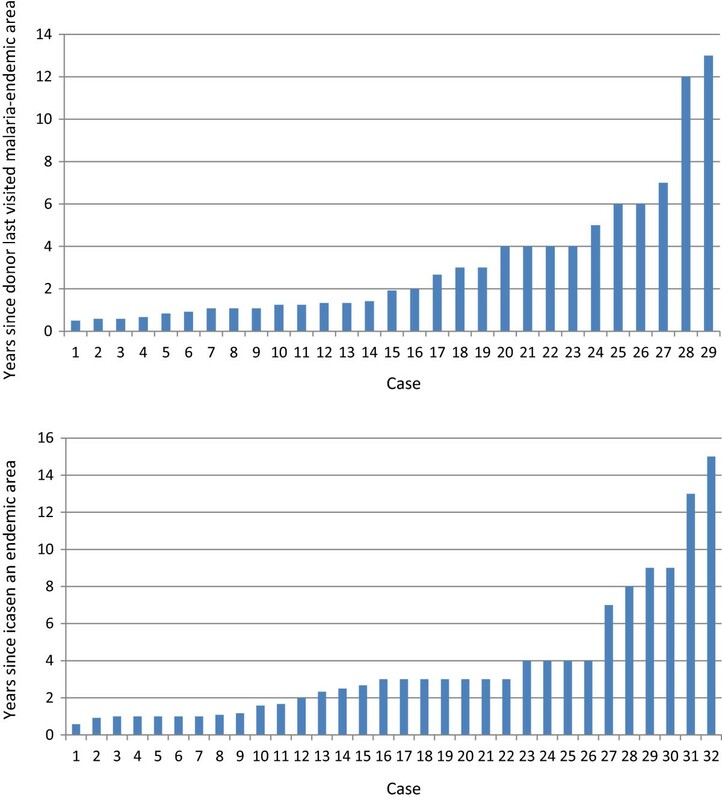 Case reports and series investigating blood donors following accidental malaria infection of blood transfusion recipients and other sporadic malaria cases in non-endemic countries have shown clearly that asymptomatic P. falciparum infections may persist for up to a decade or longer (maximum confirmed 13 years). Current policies in malaria-free countries of excluding blood donors who have lived in malarious areas are justified. Vigilance for longer than three years after declaring elimination in an area may be needed. Plasmodium vivax and Plasmodium ovale are often considered the malaria parasites best adapted to long-term survival in the human host because of their latent exo-erythrocytic forms. Yet Plasmodium malariae, which has no latent forms, can persist asymptomatically in the blood for decades, and perhaps throughout the entire life of the host . Many of these persistent asymptomatic P. malariae infections have been revealed by blood donation , with illness in the recipient (but not the donor). The maximum duration of asymptomatic infection is relevant both to transfusion risks and also in planning and evaluating malaria elimination. Characterization of the natural history of untreated or partially treated Plasmodium falciparum malaria comes first from the early descriptions of neurosyphilis patients who were given malaria. Malariatherapy, the brainchild of the Viennese neuropsychiatrist Julius Wagner-Jauregg, was introduced as a treatment for neurosyphilis in the 1920s, and was widely used until supplanted by penicillin in the 1950s. The malariatherapy parasite of choice was generally P. vivax rather than the more dangerous P. falciparum, but all species were used. Detailed studies of syphilis patients infected with strains of P. falciparum reported durations of infection between 50 and 500 days depending on the infecting strain [3, 4]. The duration of P. falciparum infections was debated by malariologists during the first era of malaria eradication (in the 1950s) as it was a key consideration in the investigation of any sporadic cases in the post-elimination period. A review by Covell in 1960 presented the prevailing opinion that P. falciparum infections generally did not continue beyond one year although he noted nine cases where infection had recurred between one and two years after the primary infection, and he cited Ciuca’s review of 12,842 cases of experimental malaria from Romania showing a maximum persistence of P. falciparum infections of 27 months [5–7]. In 1964 Jacques Verdrager, a WHO malariologist, reviewed the literature again and added his own observations from the Malaria Eradication Project in Mauritius which suggested that P. falciparum could persist in humans for at least three years. One example was probable transfusion malaria from a donor who must have been parasitaemic for more than two years. Another was a presumed recrudescence of falciparum malaria in a young woman who had a documented episode of malaria three years previously, after which she had resided in an area considered free of malaria transmission . Cohort studies in endemic areas have also proved informative. Between 1931 and 1934 in Puerto Rico, Earle followed a cohort of 71 schoolchildren prospectively with very frequent blood sampling for microscopy and found that some P. falciparum infections continued for up to 121 weeks . A mathematical modelling approach has been used to estimate the duration of falciparum infections using repeated cross-sectional survey data from other cohorts, such as the subjects in the Garki project in the 1970s. Estimates for the total duration of infection across all age groups were long at 602 days (95% confidence interval (CI) 581–625) for Pare-Taveta (in Kenya/Tanzania), 734 days (95% CI 645–849) for West Papua, and 1,329 days (95% CI 1,193-1,499) for Garki in Nigeria . Until molecular genotyping was introduced it was not possible to distinguish chronic single infections from multiple repeated infections in endemic areas, suggesting that the predicted longevity of blood stage infections based on microscopy data might be overestimated. The protracted duration of natural infections was demonstrated in Eastern Sudan where 16 of 43 individuals who had either had a malaria illness during the transmission season or were PCR positive for P. falciparum malaria at the end of the malaria season remained chronically infected throughout the dry season and the following rainy season with the same genotype . In high-transmission areas asymptomatic parasitaemia is very common. The ability of individuals to control their parasitaemia at low levels without symptoms (premunition) results from the gradual acquisition of immunity following repeated or protracted exposure. In these areas uncomplicated and severe malaria are predominantly diseases of young children. Superinfection is usual with individuals harbouring multiple, genetically unrelated, parasite clones in a constantly changing equilibrium, often generating transmissible densities of gametocytes but remaining below the combined asexual parasite density that provokes illness [12–14]. Sometimes the host immune response to repeated malaria infection is excessive, manifest by the syndrome of hyper-reactive malarial splenomegaly (HMS); marked splenomegaly with hypersplenism and hypergammaglobulinaemia (in particular raised IgM). Plasmodium falciparum is usually responsible. Anti-malarial antibody titres are high but microscopy examination of blood smears is usually negative. Persistent or recurrent active malaria infection is confirmed by response (shrinkage of the spleen) to effective anti-malarial treatment (often in a prolonged course to prevent re-infection). Typical histopathological findings in the spleen are non-specific cellular hyperplasia and lymphocytic infiltration without malaria pigment. Two cases of symptomatic falciparum malaria occurring post splenectomy (performed for suspected lymphoma) were reported from France. Both were in immigrants who had not visited a malaria-endemic area for at least two years. Their diagnoses were changed to HMS retrospectively and indicate persistent active infection throughout this more than two years interval . Similarly, a case report in Australia described a 28-years-old woman, born and brought up in Eritrea and Sudan, who developed falciparum malaria following splenectomy nine years after arriving in Australia. Histopathological findings in the spleen were compatible with HMS . Examples of chronic falciparum infection, such as these from non-endemic countries, are very informative since the possibility of re-infection can be excluded with confidence. The richest source of information on persistent malaria comes from reports of malaria in recipients of blood transfusions or transplants in non-endemic areas. The first report of malaria as an accidental consequence of an artery to vein blood transfusion was described in 1910 by Woolsey . The efficiency of blood transfusion in transmitting low density parasitaemias to naïve recipients was exploited by Fairley in his classic studies of the biology and chemotherapy of human malaria conducted in Cairns in the 1940s . Fairley also observed protracted infections in some of his volunteers. A review of transfusion malaria published in 1974 summarized 2,001 cases of transfusion-transmitted malaria between 1911 and 1972, of which at least 88 were due to P. falciparum. The details of most of these cases are not in the public domain. In those for whom information was available, the mean time between the transfusion and the onset of symptoms of malaria was 10.5 days (i.e., five asexual cycles) for the P. falciparum cases. Assuming a multiplication factor of approximately ten-fold per cycle and a pyrogenic threshold of 108 parasites in total in an adult, this suggests an inoculum of ~1,000 parasites in a blood bag or bottle of approximately 500 mL. Thus the likely donor density approximated an average of 2 parasites/mL, well below the pyrogenic (and microscopy detection threshold) density of ≥50,000/mL. A search of Pubmed and Embase was performed for case reports of transfusion or transplant transmitted falciparum malaria or for cases of falciparum malaria presenting more than six months after leaving an endemic area. Cited references were used to identify other cases. Cases of transfusion-transmitted malaria from the USA were searched for in the annual MMWR malaria surveillance reports. Searches were also performed in websites of blood banks and the international haemovigilance network . Reports of cases were excluded if the species was described as ‘tertian’ malaria without further clarification, if in languages other than English or French, or if the probable duration of the infection in the case or donor was six months or less. Twenty-nine cases of transfusion and transplant-transmitted falciparum malaria are summarized in Table 1. The time interval from last possible exposure to malaria and the accidental transmission of the infection ranged from six months to 13 years, but was less than two years in half of the cases. However, this uses a very conservative definition of the last time the donor was in an endemic area as the time of acquisition, thus all the estimates here are minimum possible estimates and very likely underestimates of true durations of infection. Donors included immigrants from malaria-endemic countries and non-immune donors who had acquired their malaria abroad, e.g., soldiers. The time between the transfusion and the onset of symptoms varied between four days and four weeks. This suggests a variety of inocula and multiplication rates (Figures 1 and 2A). Merchant seaman with trips to malarious areas 1942–7 and intermittent anti-malarials. History of malaria, most recent in Solomon Islands in 1953. Back in Australia since April 1957. 22-years-old American soldier in Vietnam 1966- March 1967. Took prophylaxis. Case 2: 25-years-old female, transfused for post-partum haemorrhage. Developed fever ~2 weeks later and then severe malaria with coma. Diagnosis finally made 3 weeks post transfusion. 21-years-old American soldier in Viet Nam 1967–1968. Took prophylaxis. 56-years-old male with laryngeal carcinoma. Post-surgical transfusion; no relevant travel history. Died of cerebral malaria about 3 weeks post operatively. Rare P.F T seen finally after multiple negative smears and a 500 ml phlebotomy. 34-years-old male. End-stage renal failure on haemodialysis, born in Italy, in USA since 1955. Monthly blood transfusions. Developed falciparum malaria in 1970 with symptoms 7 days post transfusion. No relevant travel history. Ghanaian, immigrated to USA in Oct 1969. No history of malaria. One P.F T ring form found on thin smear. Serology positive. 30-years-old male. Orthopaedic surgical procedure (correction of pseudarthrosis) with transfusion in 1973. Fever 2 weeks later.Eventual microscopy diagnosis of falciparum malaria. Had never left France and no history of malaria. Donor born in Senegal, living in France since 1960, no history malaria. 8-years-old Canadian male, treated for chronic lymphocytic leukaemia, admission with high fever. Cerebral malaria diagnosed post-mortem, including sequestration of parasitised erythrocytes in cerebral vasculature. Last recorded blood transfusion was post gastrectomy 12 years earlier. No travel; route/time of malaria acquisition unknown. 50% parasitaemia on pre-mortem slides examined retrospectively. 65-years-old female, transfused at cardiothoracic surgery (for rheumatic mitral stenosis) in 1982. Developed post transfusion falciparum malaria with 5% parasitaemia diagnosed by microscopy 16 days post surgery. No relevant travel history. 83-years-old female with myelodysplastic syndrome; transfusion dependent. 1991: developed falciparum malaria 23 days post- transfusion diagnosed by microscopy of blood and bone marrow aspirate. No relevant travel history. Donor was previously a long-term resident of Papua New Guinea. Donor 1: 19-years-old female from Ghana originally and living in Canada for 4 years. Donor 3: Originally from Cameroon. 70-years-old male with ischaemic heart disease and aortic aneurysm, transfused peri-operatively in 1999. Developed post-transfusion falciparum malaria with symptoms 2 weeks post-op (confirmed by microscopy 1 week later) and died. 30-years-old male born in Cameroon, with history of malaria aged 15 years. Moved to Europe 10 years before blood donation. Last trip to Cameroon 6 years before. 69-years-old male, transfused in 2003 following upper gastrointestinal bleed. No relevant travel history. Re-admitted 2–3 weeks post transfusion with falciparum malaria diagnosed by microscopy. 18-years-old blood donor of Ghanaian origin living in USA for 11 months. Treated for malaria 2 years previously. Slide and PCR negative. Serology (IFA) positive. 81-years-old male, Type 2 diabetes mellitus, post transfusion cerebral malaria and death in 2002. Symptoms developed 2 weeks post transfusion. No travel to an endemic area for 20 years. Male, UK born, worked in Africa for 10 years and history of malaria. Case 3: 62-years-old male, fever 4 days post transfusion for gastrointestinal bleeding in 1997. Served in Egypt in WWII. Otherwise no travel. Died of cerebral malaria. 19-years-old, Ghanaian female. UK national since aged 6 months. Travelled to Uganda in 1994 travelled to Uganda for 6 weeks where she reported undiagnosed fever. Case 4: 51-years-old male with sickle cell anaemia and chronic renal failure. Post transfusion falciparum malaria in 2003. No history of travel to malarious area. Left Jamaica for UK in 1957. 25-years-old female with sickle cell anaemia, multiple transfusions in 2007, admitted with falciparum malaria (16% parasitaemia) more than 1 month post transfusion. Case 2: 78-years-old male receiving chemotherapy for lung carcinoma diagnosed with falciparum malaria after anaemia investigated. Several blood transfusions in previous 10 months, most recent 2–4 weeks previously. No travel in the last year. 55-years-old female; cardiac surgery and blood transfusion. Re-admitted 1 month later with falciparum malaria (microscopy and PCR positive). No recent relevant travel. 27-years-old Ghanaian female, living in USA since 1972 with end stage renal failure. Developed post-transplant falciparum malaria 2 weeks after receiving live related transplant from her mother. Treated, rejected kidney, graft nephrectomy. Second transplant a year later (cadaveric). Post transplant falciparum malaria 5 months later. P.f.T: P. falciparum trophozoites, *: abstract only, **: Kidneys also transplanted to 2 recipients, 1 died of CMV but seroconverted for malaria, the other did not seroconvert. Relationship between size of parasite inoculum and time to microscopy detection. Cases of transfusion or late-presenting clinical malaria showing minimum interval since last malaria exposure of donor or case. A Transfusion-transmitted falciparum malaria B Non-transfusion cases. Table 2 and Figure 2 summarize 32 cases of falciparum malaria in individuals diagnosed between seven months and 15 years after leaving a malaria endemic area. Plasmodium falciparum gametocytaemia was reported in three of the cases. In one case, gametocytes were the only parasite stage seen on the blood film a month after a fever episode, suggesting the patient had self-cured the infection. Five cases reported having taken antimalarial drugs previously. In 13 cases the symptomatic episode coincided with pregnancy (seven women) or was associated with a co-morbidity, e.g., diagnosis of malignancy (one), diabetes mellitus (one), post head-injury (one), sickle-cell anaemia (one), HIV (two cases), which suggests a reduction in host immunity may have unmasked the latent infection. 7-years-old male, originally from Comoros islands presenting with a febrile illness. P. falciparum trophozoites and gametocytes seen on microscopy, mixed with P. ovale. 30-years-old male, originally from Ghana. Presented with diabetic ketoacidosis. Malaria diagnosed by microscopy. Serology positive. Obstetrician/gynaecologist admitted with fever. Last trip to a malarious area was 15 years before (Afghanistan). Diagnosed on microscopy. Labelled as cryptic malaria (occupational exposure cannot be excluded). 28-years-old female, born in Eritrea and then lived in Sudan. Post splenectomy malaria. Pre-operative slides negative. Retrospective histological diagnosis of hyperreactive malarial splenomegaly. 29-years-old pregnant woman. Originally from Ghana but living in Italy for 9 years. Last trip to Ghana 4 years previously. Presented with fever and vomiting. Positive P. falciparum rapid diagnostic test, microscopy and serology. 18-years-old male with sickle-cell anaemia, born in Togo, living in Sweden for 14 years. Last visit 4 years previously. Presented with fever. Microscopy, RDT and PCR positive for P. falciparum. 30-years-old male, originally from Guinea-Conakry and moved to Belgium 9 years earlier. No other travel of note. Friend from Guinea stayed with him 2 weeks earlier (raises possibility of ‘baggage malaria’). 60-years-old Italian engineer, worked in Tanzania for 33 years where he was treated for malaria. Returned to Italy January 2006 and was diagnosed with carcinoma of the lung and splenomegaly. Fever episode 11 months after return to Italy which resolved spontaneously and P. falciparum gametocytes seen on a blood smear 1 month later. 29-years-old Angolan female. Immigrated to Canada in 1999, no relevant travel in intervening period. History of treated malaria in Angola. Presented with fever. Falciparum malaria diagnosed by microscopy and PCR. Case 2: 31-years-old female, presented to the emergency department with severe falciparum malaria (10% parasitaemia). Travelled to Nicaragua in 2008; took prophylaxis. 8-years-old female, originally from Nigeria. Moved to USA 2007, one trip back in 2008. Malaria history not documented. Presented symptomatic to USA hospital. P. falciparum diagnosis confirmed by microscopy and PCR. 48-years-old male, born in Burkina Faso, immigrated to Netherlands 8 years previously, last travel to an endemic country 2.5 years previously. Last anti-malarial drugs in 1997. Admitted with severe malaria confirmed by RDT, microscopy (P. falciparum trophozoites and schizonts) and PCR. RDT: rapid diagnostic test, PCR: polymerase chain reaction, IFA: indirect fluorescent antibody assay. The ability to detect asymptomatic carriers of malaria parasites depends on the sensitivity of the detection method used. Blood smear microscopy by experienced microscopists will detect parasite densities of ≥50/μL reliably. More recently, molecular methods have been employed to detect sub-patent parasitaemias. PCR is considerably more sensitive than microscopy or rapid diagnostic tests based on antigen detection but typically blood samples have been taken from finger-prick blood spots on filter paper, thus a volume of only ~5 μL has been amplified. This obviously misses densities which are below one parasite in 5 μL or 200 parasites/mL. In general, most PCR methods have limits of detection of ≥1,000 parasite/mL. Using larger blood volumes parasite densities down to ~20/mL can be detected, several orders of magnitude below the microscopy level of detection . Malaria infection may also be assessed using serology, although interpretation is difficult. A variety of crude and more refined test antigens have been evaluated. Typically seroprevalence increases with age while the correlation with patent parasitaemia goes down [61, 62]. The usual duration of positive malaria antibody responses once an infection has been cleared with or without anti-malarials, in the absence of ongoing exposure, and the specificity of negative serology results to exclude active infection are both uncertain. Longitudinal serological studies have been conducted in immigrants who have moved to countries that are malaria free. In a Spanish study IgG antibody levels against the erythrocytic antigens AMA-1 and MSP-142 (3D7 and FVO strains), EBA-175 and DBL-α, did not correlate with the time since migration . Serology is used by a number of transfusion services for blood donor screening. Between 2005 and 2011, in the USA, 5,610 malaria-deferred donors were tested by EIA, including 5,412 travel deferrals. Overall, 88 (1.6%) of tests were EIA reactive on repeat testing, none of which were PCR positive . In the transfusion-transmitted malaria cases summarized in Table 1, 11 donors had positive serology between ten months and 13 years after leaving an endemic area but were PCR or slide negative, suggesting that isolated positive serology may signify persistent low density parasitaemia below the detection threshold of conventional (i.e., low blood volume) PCR techniques which is approximately 1 parasite/μL. Given these uncertainties many blood transfusion services opt for a conservative policy of excluding donors who have lived in malaria-endemic areas. There is good evidence that chronic sub-patent infections are a source of onward mosquito transmission of malaria. In semi-immune individuals with persistent infections, gametocytaemia at densities below the limit of microscopy detection is often infectious . In 1931 in South Africa, Swellengrebel estimated that crescent densities of only 1: 5,100 leucocytes were sufficient to infect anopheline mosquitoes and in 1945 Robertson recorded infections at thresholds below three crescents per 1,000 leucocytes in Anopheles gambiae in West Africa . Ciuca et al. studied the infectivity of long-term asymptomatic P. falciparum malaria to laboratory-bred Anopheles atroparvus following experimentally induced infections in ten individuals . They observed infectivity rates of 0.7-7% even when no gametocytes were seen on microscopy examination of three thick films. Transmission was confirmed up to the 175th day after infection. These reports show unequivocally that P. falciparum can survive for extended periods in the human host. The previously quoted maximum duration of two years should be revised; 13 years is the maximum confirmed duration reported to date. The transfusion malaria cases suggest the parasite continues its erythrocytic life cycle at very low densities, kept in check by the host’s immune response. This is a common pattern for malaria parasites in all animals, and is the most likely explanation for persistence of both P. falciparum and P. malariae in man. There is no evidence for protracted dormancy or an exo-erythrocytic parasite stage of these parasites, although it is possible that the entire life cycle could take place in the vascular spaces in the placenta or spleen. Incomplete antimalarial drug treatment may have a modulatory effect on the infection early on. As well as the poorly understood host’s response to the parasite, P. falciparum possesses sophisticated immune evasion mechanisms, notably the differential serial expression of var genes encoding for Pf EMP1, the major surface antigen of the blood stage . 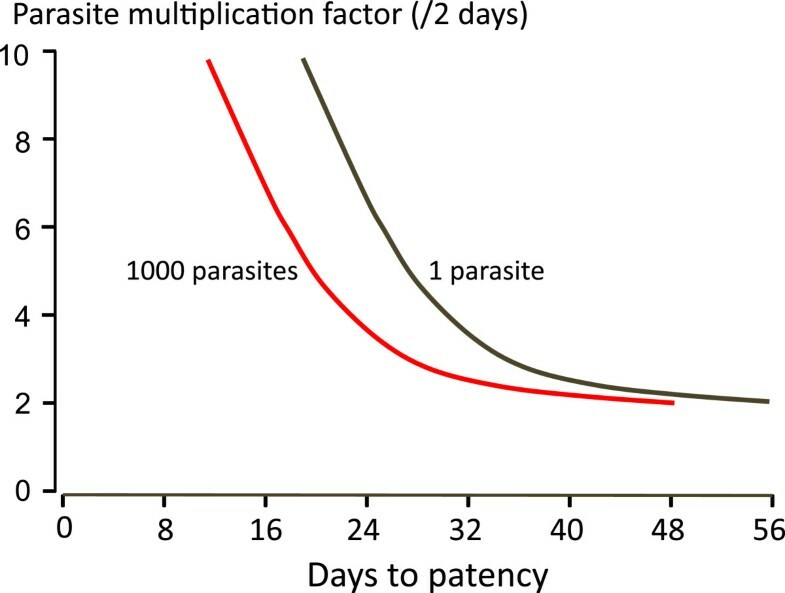 How P. falciparum parasites survive for prolonged periods in the human host without exhausting their repertoire of antigenic variation is unclear. The appearance of symptoms years after infection may reflect waning of host immunity. The late recrudescing infections presented in Table 2 were associated with concomitant conditions, which may have led to immunosuppression in several cases, e.g., diabetes mellitus, malignancy, and pregnancy. It is not possible to estimate how common chronic infection with P. falciparum might be. The World Malaria Report estimated that in 2012 there were between 135 and 287 million malaria cases of which 91% were caused by P. falciparum. Even if only a tiny proportion of untreated or partially treated infections become indolent, this represents a huge potential reservoir of sustained transmission. Approximately 107 million units of blood donations are collected globally every year . Very few blood transfusion services perform routine malaria antibody testing, with most non-endemic countries relying on deferral of donors considered to be at risk. This appears to be very effective in preventing the vast majority of cases of transfusion-transmitted malaria . It is also possible that some transfusion-transmitted parasites do not cause disease. A large proportion of the transfusion-recipients presented in Table 1 were older, with co-morbidities such as malignancy, diabetes, end-stage renal failure, and sickle-cell anaemia and thus may have been more susceptible to malaria following inoculation of very low numbers of parasites than immunocompetent recipients. The requirement for blood transfusion indicates anaemia and therefore illness. Furthermore, blood transfusion itself is associated with immunosuppression . The incidence of transfusion-transmitted malaria in endemic countries is probably far higher than realised since screening by microscopy only is usually the method used to select donors and antimalarial drugs are not added to blood donations. Transfusion malaria could become an important source of malaria within countries where there is incomplete elimination. These observations on the longevity of falciparum infections and the sub-microscopic parasite burden are relevant to immigrants and refugees who have left malarious areas. In a parasite prevalence study of 195 African refugees in Italy in 2007, 62 patients tested positive for malaria using molecular detection methods, of whom 13 were gametocytaemic. Microscopy confirmed the positive results in 14 of the 62 cases, of which 13 were P. falciparum. The reported prevalence of asymptomatic malaria in refugees screened post-arrival ranges from 2.4 to 31.8%, depending on the population and the method of diagnosis. Where malaria vectors are present these people may act as a source of transmission. The possibility that asymptomatic infections with artemisinin-resistant falciparum malaria could be imported from Southeast Asia to Africa is a current concern. In countries targeting malaria elimination, achieving this aim is likely to take longer if the sub-microscopic parasites are not eliminated. Improved high-throughput and low-cost methods are needed to detect these individuals harbouring low parasite densities. Conventional PCR methods still miss infections with densities below 1/uL. Serology has been proposed as a useful tool to detect changes in malaria transmission in settings where transmission is in decline and appears to be a sensitive method for the detection of malaria infection but its specificity is unclear, as is the usual duration of detectable antibodies once an infection has cleared. There is a need to investigate the role of serology in defining asymptomatic carriage, certainly in lower transmission and pre-elimination countries. 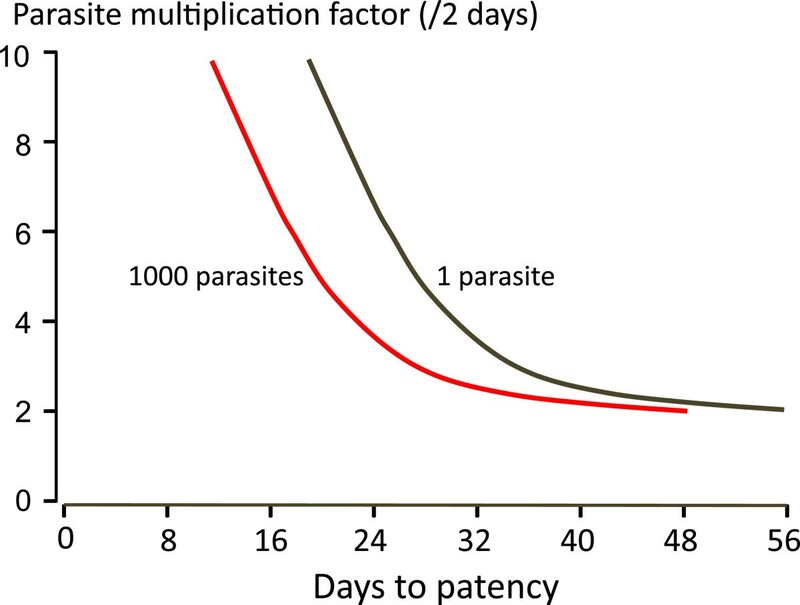 Plasmodium falciparum can persist in the human host for longer than thought previously. Current policies in malaria-free countries of excluding blood donors who have lived in malarious areas are justified. Vigilance for longer than three years after declaring elimination in an area may be needed. We would like to thank Dr Alan Kitchen for providing additional information on transfusion related malaria. NJW had the idea for the review. EAA reviewed the literature. Both authors drafted the manuscript. Both authors read and approved the final manuscript.